Popular tourism and business destinations, like Chicago, experience significant weekly and monthly fluctuations in lodging demand. Different leisure, corporate, and convention travel schedules combine to create patterns of peak lodging demand throughout Chicago’s downtown area. June is the busiest month, typically followed by July and September. Saturday is the busiest night, typically followed by Friday and Wednesday. So, for example, during the four Saturday nights that occurred in June of 2016, the average hotel occupancy was 95.1 percent across all 220 hotels in the Chicago market. When markets experience peak occupancy periods of this magnitude, you can bet that many of the most popular hotels are completely sold out. When this occurs, some potential travelers that would like to visit Chicago decide against making the trip because they could not find a hotel room they liked. That is, the market has pent-up demand. Hotel consultants sometimes refer to this pent-up demand as “unaccommodated” lodging demand. The number of room nights that could have been sold in a given market, during a given time period, at the market rate, if additional and adequate lodging inventory had been available. There are other definitions of pent-up demand or unaccommodated demand. In general, these definitions focus on determining how much lodging demand does not materialize in a defined market due to sell-out patterns and supply constraints. Anyone trying to forecast a market’s future hotel occupancy needs to understand pent-up demand for that particular market. In most markets experiencing new hotel construction, this pent-up demand is likely to be an important part of how supply and demand interact to determine market-wide hotel occupancies. The more pent-up demand a market has, the less impact new supply will have on market-wide occupancies. Consider a market with 10 hotels, each having 100 guestrooms. This market has a total inventory of 1,000 guestrooms, or 365,000 room nights of supply available annually. Assume annual occupancy has historically been 70.0 percent during recent years in this market. So, annual lodging demand equates to 255,500 sold room nights. Now suppose a developer comes to town and builds a new 200-room hotel in the middle of this market. So, annual hotel supply jumps to 438,000 room nights. If no additional demand is generated in the market, average occupancies will fall to 58.3 percent! This is perilous territory for hotel owners and investors. By contrast, if a market has significant pent-up demand, some of the previously unaccommodated demand that wanted to come to this market will now be able to enter the market because the new supply makes room for these lodgers. So, this pent-up demand can cushion the shock of new supply. For example, assume the previously described market had 40,000 room nights of pent-up demand that historically could not be accommodated each year. If this pent-up demand can now be accommodated in the market because the new 200-room hotel makes more rooms available during peak demand periods, then this market’s occupancy would only fall to 67.5 percent. From this simple example, readers can recognize the critical importance of accurately estimating pent-up lodging demand when attempting to forecast hotel occupancies. Despite the obvious importance of accurately estimating pent-up lodging demand, this task remains one of the most critical “blind spots” for hotel investors, appraisers, and analysts. Few companies have invested the resources needed to develop accurate models for quantifying pent-up lodging demand. We discuss some of the methodologies currently employed in the industry. Method #1 – Unfortunately, some analysts do not even recognize the need to quantify pent-up demand. Instead, they simply apply historical growth rates to last year’s lodging demand and assume that lodging demand will grow in the future similarly to how it has in the past, regardless of the size and timing of new supply shocks. Any hotel owners who have experienced hotel building booms in their markets can attest to how erroneous this methodology can be. Method #2 – Some hotel analysts recognize the importance of pent-up demand and have developed input fields in their models to account for pent-up demand. Unfortunately, the sophistication sometimes ends there. After creating a detailed input-output model to predict hotel occupancies, analysts essentially “make a guess” about unaccommodated demand. Recognizing the importance of accounting for pent-up demand is a step in the right direction. But using a guess to quantify this demand is not ideal, even when experienced hotel experts make the guess. Method #3 – A third methodology, developed by Hotel Appraisers & Advisors, and provided to other consultants in the industry, attempts to estimate pent-up demand in a market by mapping out historical patterns of hotel sell-out nights. After quantifying sell-out patterns, consultants create a hypothetical scenario assuming a defined amount of extra supply had been available in the market during the defined peak demand or sell-out periods. By building up this hypothetical scenario, consultants can quantify a reasonable estimate of pent-up lodging demand for the defined market. 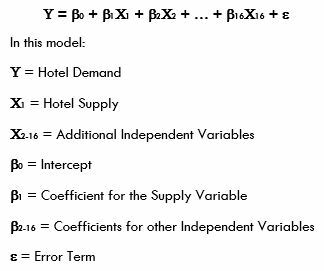 The model isolates “hotel supply” as one of the independent variables used to predict hotel demand. As expected, this variable is both statistically significant and can have a large coefficient in markets with significant pent-up demand. This is particularly true in markets with peak demand months that exceed 80 percent occupancy. The results of Method #4 were generally consistent with the results of Method #3. Although these methodologies are designed to be independent, we consider their similar results to be evidence in support of both methods. How Many More Hotel Rooms Can Chicago Support? Hotel Appraisers & Advisors focused on the Chicago market as a case study for quantifying pent-up lodging demand with the preceding methodologies. One question the models help us try to answer is: how many more hotel rooms can be supported in the Chicago market? The answer depends on how far you are willing to let market occupancies fall. A typical rule of thumb for identifying healthy hotel markets is whether market-wide occupancies are at or above 70.0 percent. When markets experience consecutive years of occupancies exceeding 70.0 percent, then developers will often target such markets for new hotel development. Therefore, we attempted to measure how many hotel rooms could be supported in the Chicago market before market-wide occupancy would fall below 70.0 percent. Our computed answer, as of the end of 2016, was roughly 9,500 additional guest rooms. At the time of this article, 2,063 additional guest rooms were currently under construction in the Chicago market. So, we expect some supply-related downward pressure on occupancies in the near-term, but not enough to push occupancies below 70.0 percent. So, if the full capacity of 9,500 additional guest rooms were built in Chicago, how much pent-up demand would likely be attracted to this market? Based on our Method #4 modeling, we calculated approximately 1.61 million room nights of pent-up demand would be accommodated in Chicago annually. Based on our Method #3 modeling, which we provide to industry analysts, we estimated there are 1.60 million room nights of annual pent-up lodging demand in Chicago. While these two methodologies are independent and can sometimes differ, they produced very similar estimates for the Chicago market. The Chicago lodging market has experienced significant growth in both supply and demand in recent years. Even with growth in Chicago’s lodging supply, we estimate the market experienced approximately 168 peak-demand nights in 2016. Despite the large number of new hotels under construction, the pipeline of new supply does not represent the full capacity of what the market could bear at a 70-percent occupancy level. Therefore, we anticipate market-wide occupancies will remain above this threshold for the near future, barring a decline in demand. Furthermore, we have identified large volumes of pent-up demand that will partially insulate existing hotels from the shock of planned new hotel supply. However, hotels that suffer from inferior locations, amenities, obsolescence, age, and other competitive factors may be disproportionately affected by the negative occupancy impacts caused by new supply. This article is not intended to serve as a prediction for any particular hotel or for the Chicago lodging market at large. Rather, this article provides one estimate of pent-up lodging demand in the Chicago market. It is intended to highlight the importance of understanding pent-up lodging demand when analyzing hotel markets. For the purpose of this analysis, HA&A studied the market area STR defines as the “Chicago Downtown” market tract. This area encompasses most of the City of Chicago, as well as some suburbs. The area stretches south to 55th Street and north to Howard Avenue. It extends west to include Elmwood Park, Forest Park, Riverside, and Stickney. But it excludes the areas immediately surrounding O’Hare and Midway airports. This calculation assumes no additional sources of lodging demand growth other than supply-related unaccommodated demand. We define peak-demand nights in this market to be the number of nights when market-wide occupancy exceeds 83 percent. During such periods, many hotels are completely sold-out, even though poorer performers are not.